Please click on the image to see a larger version. I woke up at 2:30 this morning to capture the lunar eclipse. The clouds rolled in and obscured the 2nd half of the celestial event, but I was able to capture the 1st half. The Rizal bridge was a perfect venue for this shot. My friend and I were the initial ones there, but by the end, I counted a dozen photographers lining the bridge. For this picture, I first captured the night lights with a long exposure (30 sec, f/11, ISO 100). Then, I took several other short (1/125th sec, f/5.6, ISO 100) exposures, each about 8 minutes apart to capture the lunar eclipse and its course. In the digital darkroom, I combined the exposures to produce the composite image you see here. This is sensational!! You must be thrilled to have it captured! And I love your title! 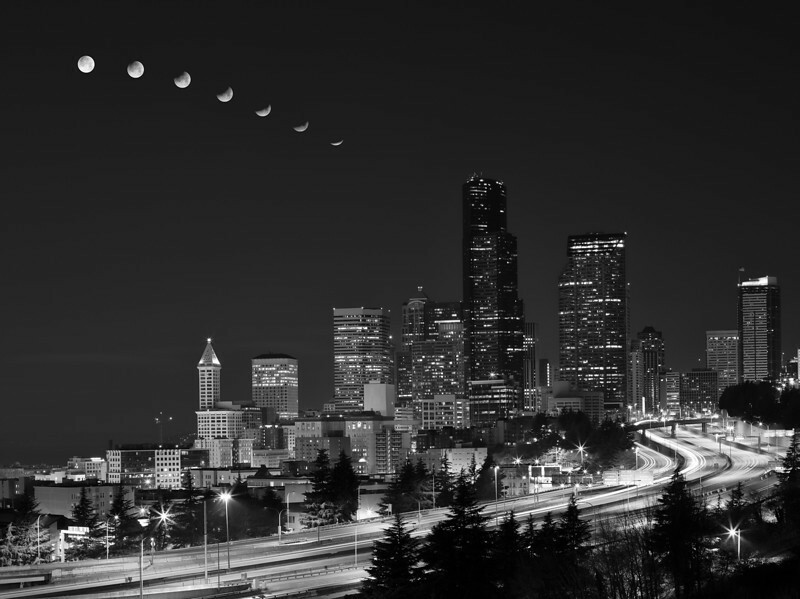 Mahesh, Just great that you have captured the eclipse so beautifully with the city lights. Spectacular. First of all, AMAZING shot. Secondly, it’s interesting to think about how much went in to making this image happen… Clearly, you had to investigate where to position yourself for the best angle. Sounds like an event like this was a perfect way to meet fellow photo fanatics! Thanks for “suffering” so that those of us, warm in our beds, could enjoy the event through your camera lens, Dr. Thapa! You are amazing. I knew there was an eclipse and was sad to have missed it. Very nice shot. I would have guessed you would have needed longer exposure or, bigger aperature, or higher iso for the moon shots–good to know. Thanks for the tech info. Oh, Im so happy to be seeing this. I missed it when it happened and this is even better because it’s a glimpse of each phase. Thanks, Mahesh! Want to buy your photo.